Pre-orders are officially being taken today for the Tata Nano in India at an MSRP of 100,000 rupees (just under $2,000). 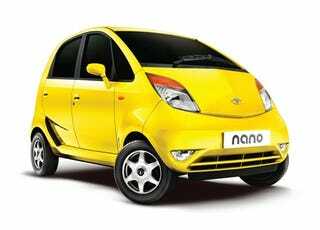 That makes the Nano officially the cheapest automobile in the world. The on-road price will be a little bit higher, probably around $2,400, once you factor in excise duty, education fees and road tax, along with transportation cost, local taxes, insurance and registration fees and "a lifetime parking fee" (applicable in some locations). The five seat basic model will be powered by a 624cc gasoline engine and does away with superfluous items like airbags but can be be optioned up, it will also launch in Europe with a slightly larger, more luxurious model in 2011. The car is launching into one of the strangest sales markets ever faced, with pent up demand for the car at a fevered pitch in India, but an overall depressed auto industry. Tata is not expected to be able to meet demand for the "1 lakh car" after being forced to used an alternate production site when its West Bengal factory faced violent protests from rural farmers.